International specialized exhibition "Climate World" is the most anticipated and intriguing event of the domestic HVAC & R market. The exhibition is held every year in early March, and puts together all progressive-minded representatives of HVAC & R business. Interest to participate in the "World Climate" is increasingly growing. Today it's just a time to take decision on the participation of your company in the ninth (from the year of foundation: 2005) exhibition "Climate World" to be held in March 11 – 14, 2013 at Expocentre Moscow, Russian Federation. The exhibition "Climate World" is traditionally focused on several important issues. Among them are promotion of advanced equipment and technologies, advocacy of civilized forms and principles of fair competition, contribution to the sustainable development of Russian business. "Climate World" offers to the manufacturers the shortest way to the market, to the government agencies and business the ability to respond quickly to any challenges of the climate and refrigeration market, including the most complex ones. Emotion-free statistics show each year the steadily-growing popularity of the event. 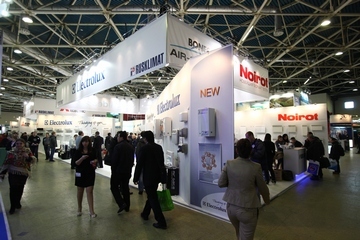 Thus, in 2010 the exhibition "Climate World" had the exposition area of 15,800 m2, 240 leading climate and refrigeration companies from 23 countries were represented; 15,200 people visited the exhibition. In 2012, more than 350 leading companies from 26 countries took part in the exhibition, they were placed on 24,000 m2 of exhibition space, number of visitors approached to 25,000 professionals! The partners of the exhibition are the largest organizations of the industry: non-commercial self-regulating organizations SRO NP "ISZS-Montazsh" and SRO NP "ISZS-Proyekt", non-commercial partnership "ABOK North-West." The project "Climate World" is supported by the National Association of Builders (NOSTROY), National Association of Designers (NOP), National Association of Self-Regulating Organizations in the Energy Audit (NOE), Centre for International Industrial Cooperation UNIDO in the Russian Federation, the Ministry of Natural Resources and the Ministry of Regional Development of the Russian Federation and many other organizations. In 2012, the exhibition "Climate World" got the status of «UFI Approved Event», it means that importance of the exhibition is recognized by the world exhibition community.